EuroCave has introduced another breakthrough in wine storage, Main Du Sommelier shelving. A must-have for every EuroCave owner, Main du Sommelier ("Hand of the Sommelier") shelving features 8 adjustable "hands" that cradle your bottles individually and securely, just as a restaurant sommelier would. Each individual hand is a slightly concave bottle-holder lined with rubber insets to prevent bottles from rolling, rattling, or clinking together when sliding the shelf. So far the refrigeration is good and quiet. to get the shelves we wanted took 4 months to arrive and the shelves were in pieces as FedEx or who ever seemed to bash the box a bit. 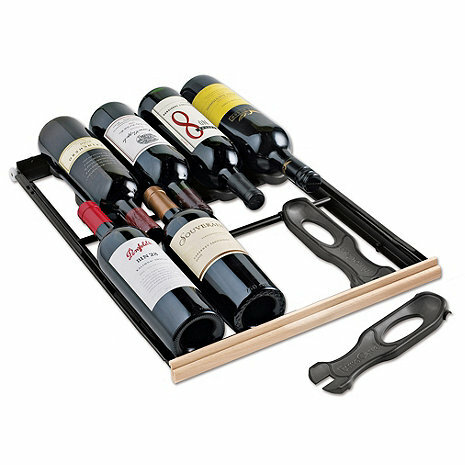 Most Napa bottles are larger and will not easily fit in the configuration shown. Each drawer is supposed to hold 8 bottles but I can only get 4 if I put Napa bottles in. They could have made the unit and drawers slightly wider to accommodate for this but then it wouldn't be French HA! I use my EuroCave as a Service Wine Refrigerator and replaced the fixed shelf with this sliding shelf.